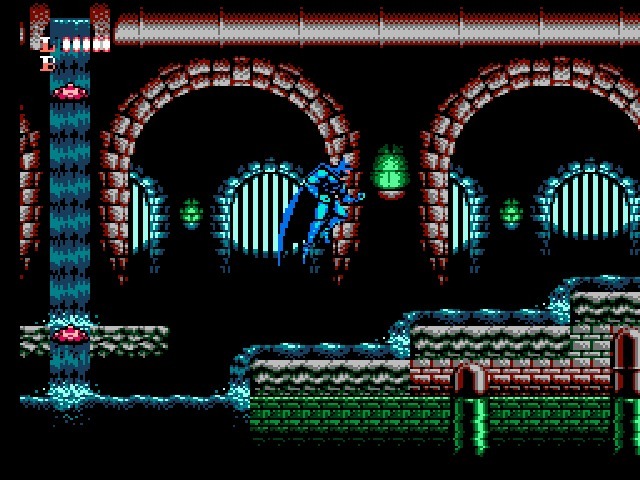 Not content to sit around and wait for Hollywood’s next Batman flick, SunSoft went right to DC Comics to pull the license for a sequel to their excellent NES Batman game. The plot is basically worthless – The Joker has escaped from Arkham and Batman must track him down – and the action pulls from a few Nintendo classics. The result is something like an anime Batman, grounded in typical Japanese game conventions more so than the film or the comics. 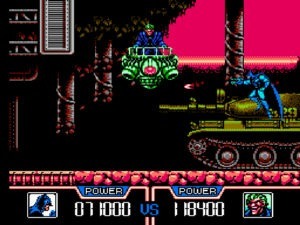 Return of the Joker is a side-scrolling action platformer that differs from the original in a few key ways. First, the character sprites are much larger, and the graphics further improved. Clouds in the first level scroll by in layers, giving an almost 16-bit rendition of a stormy sky, tree sprites shake in the wind, and backgrounds look large and detailed. Though you do get a couple of generic factory or industrial levels, there are more than a few that are graphically and stylistically interesting. There are only seven stages, so you don’t get a great deal of time to explore, but the locations here are nice. I especially like the level where you’re chased by a scrolling tank keeping pace through a couple different backgrounds. 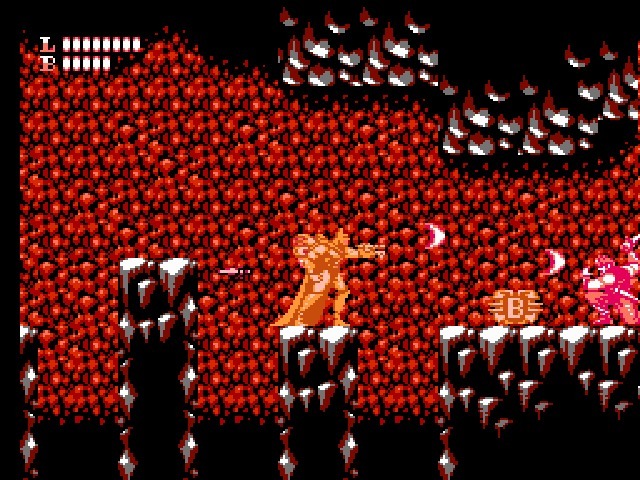 Second, the weapons system from the original has been tossed in favor of one pretty clearly lifted from Contra. There are no batarangs, physical attacks, or traditional Bat-weapons. Instead, you carry a gauntlet that shoots streams of weak bullets. If you shoot open crates scattered around the level, you’ll find gun powerups marked with a single letter (they even look like Contra’s powerups). There are three weapon options with no upgrades, though each weapon has a secondary fire triggered by holding down the B button and charging the weapon. Only one of them is particularly useful (the C beam) as it is the only one that kills regular enemies in one shot, while still being useful against the bosses. The others are a gun shooting homing bullets, and a rapid-fire gun that shoots in a useless helix pattern. If you don’t like the powerup that pops out, you can shoot it to cycle through the three options. You also get a slide attack by pressing the diagonal in the direction you want to go and hitting A. It works well against goons, and a number of bosses too. You’ll never need it to get by any level hazards, so it’s easy to forget or overlook altogether. Don’t, because it really can be quite useful. Third, as already said, there’s less here that’s true to the character. True, the first had its share of giant robots and improbably “gamey” locations, but this one takes an even more cartoony/anime look. Aside from the weapons, you can also get powerup orbs that charge a separate bar. When you grab eight of these, you temporarily change into a golden robot suit. Batman becomes invincible and shoots out an automatic stream of bullets for a short time. Aside from looking goofy, it’s not all that useful since you can’t trigger it on your own. You’re never going to be next to a boss when that eighth powerup shows up, no, you’ll inevitably be in the middle of a level with no guys around. 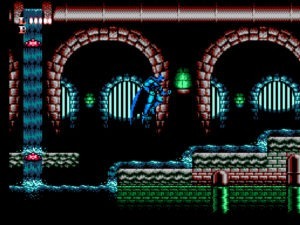 Certain levels have Batman strapping on a jetpack and shooting down aerial security bots in a minigame similar to R-Type. Boss battles begin with Batman being struck by lightning and absorbing the energy through his gauntlet. It’s all a very silly, but at least it plays well. The Joker’s been stealing vehicles from Dr. Eggman. Speaking of boss battles, the final change is that these fights are handled differently, and arguably better. During the levels, you have a typical short life bar marked out by notches. When you take on a boss, your life and the boss’ gets measured numerically. You get 80,000 points, and the bosses start lower and then eventually higher as the game progresses. It’s hard to quantify how much life that is, since boss attacks take off different numbers, but you unquestionably get more of a fair shake during these fights. They’re a little longer, you can take significantly more hits, and your performance during the level itself doesn’t limit your start here (since you recharge at the beginning of the battle). Fights themselves are duck and jump pattern-based timing challenges. The graphics are certainly sharp, and the effects make it one of the better-looking NES titles. Detail never falters, from the stones of the sewers to the hazy city background of the moving train level. Music is upbeat action that fits the scenes well. Sound effects are a disappointment, and further the whole “conventional Japanese game” theme. 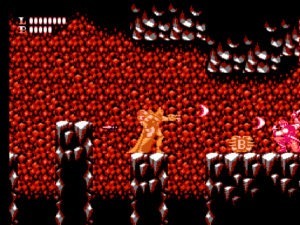 Many of the effects, especially the “stinging” noise when you get hit, sound similar to Mega Man. Gunfire and the like are generic “zowwee!” effects. All enemies explode into energy waves, with expected sounds. Return of the Joker is pretty hard, especially compared to the freely powerup-dropping enemies of the original. You’ll only get gun and suit bonuses from the occasional crates. There are no life powerups. I’ll repeat that, because it’s important – if you lose life during the level, you’re not going to get it back until the start of the next stage. That’s tough, especially in levels like the one where you’re being chased by a blimp shooting cannons and can’t take the time to be careful. Later bosses also get pretty rough, and the final two-stage Joker battle is just harsh. Collect 8 orbs and turn into golden Robo-Batman. Luckily, the game is certainly possible to beat. Each stage gets a password. You only have three lives, but each password resets you with all three when you return. I’ve already talked about the improvements to the boss battles, and they definitely give you a better chance. Also, each stage is really rather short, so there will be no impossible gauntlets keeping you on the edge. You won’t win if you’re reckless, but you have enough working in your favor. Weapons like the C beam make enemies easy to beat, there are some electric floors but few difficult platform jumps, and should you get killed, you won’t have fallen back too far. Can’t ask for more than that. 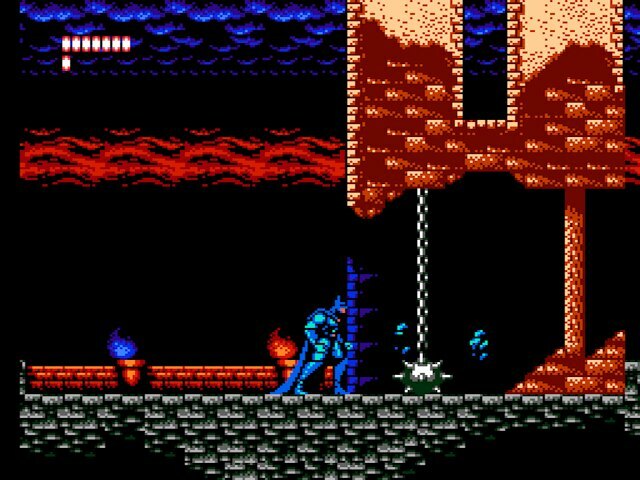 It’s certainly not the best game, and I would argue that the anime style makes it a less interesting Batman game, but it’s a solid NES platformer. 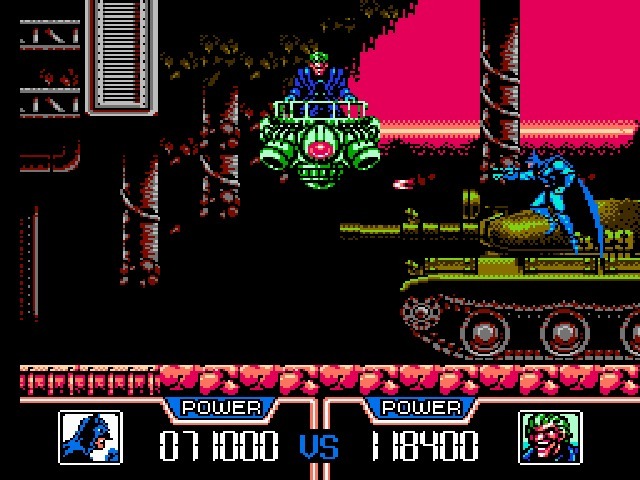 There are some creative battles during levels, like when you’re being chased by the tank, and the Joker is always fun to fight. Replay probably isn’t there, but worth a playthrough if you enjoy the genre. Very nice graphics. Fun levels and action. Excellent password system. Less of a Batman title, more of a solid, Japanese platformer. Great review of an often-overlooked NES title. Thanks for sharing.